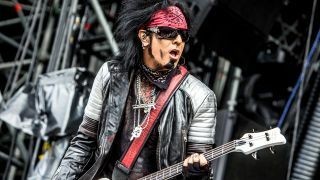 Nikki Sixx has checked in to report that he’s working on a new project which should see the light of day next year. He’s been in the studio with his old Motley Crue bandmates Vince Neil, Tommy Lee and Mick Mars recording four tracks for upcoming Crue biopic The Dirt. But in a post on Instagram, the bassist reveals he’s got something else up his sleeve. The Dirt, meanwhile, which is based on Motley Crue’s 2002 book of the same name, will launch early next year. Earlier this week, vocalist Neil revealed that it would be released on Netflix on March 22 and stars Daniel Webber as Neil, Douglas Booth as Sixx, Machine Gun Kelly as drummer Lee and Iwan Rheon as guitarist Mars. The film also features Tony Cavalero as Ozzy Osbourne and David Constable as Doc McGhee.